Another year, another battle with the garden weeds. No planting yet. So far, I've had 4 serious session with a pitchfork, turning the soil and pulling the buggers out. I need to call in some serious machinery to finish the job. Luckily for me, a co-worker is bringing hay tomorrow so I can cover up the offenders and hopefully suffocate them. My first year using hay - I'm hopeful. I plant later than most. Not because I think it's wise - it's mostly because I am too lazy to get it all done in one shot. 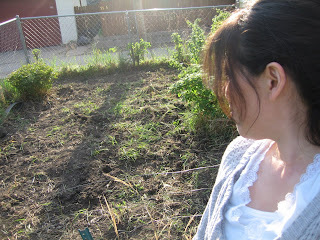 The kids (3 & 5) are finally not shrieking at the site of worms. They both enjoy holding them in their hands. The kids get "chore points" if they help mommy pull weeds. Chore points equal money at the end of the week (Preschooler payday). Our 5 year old helps pull weeds. Our 3 year old would rather hold worms. cheer up! Think of the harvest season. What are you planting?? I would plant potatoes. and really easy stuff to guarantee success. If the hay doesn't work, I would totally help you weed your garden. I'm jealous that you actually have a yard where you can have one!